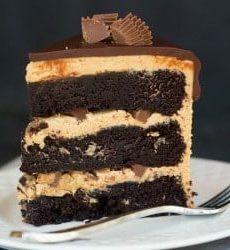 A sinfully rich three-layer chocolate cake with peanut butter frosting, chopped peanut butter cups and a chocolate ganache. Make the Cake: Preheat oven to 350 degrees F. Grease three 8-inch round cake pans, line the bottoms with rounds of parchment paper, grease the parchment, then flour the insides of the pans, tapping out excess; set aside. In the bowl of an electric mixer (or large mixing bowl if you're using a hand mixer), sift together the flour, sugar, cocoa powder, baking soda, baking powder and salt. In a medium bowl, whisk together the eggs, buttermilk, coffee, oil and vanilla. Add the wet ingredients to the dry ingredients and mix for 2 minutes on medium speed. Scrape the sides and bottom of the bowl and mix for an additional 20 seconds (the batter will be very thin). Divide the batter evenly among prepared pans. Bake for 20 minutes and rotate the pans in the oven. Continue to bake until a toothpick inserted into the center of one of the cakes comes out almost clean (with a few moist crumbs), about 12 more minutes. Cool the cakes (in the pans) on wire racks for 20 minutes, then carefully turn them out onto cooling racks to cool completely. Make the Peanut Butter Frosting: Place the powdered sugar, peanut butter, butter, vanilla and salt in the bowl of an electric mixer fitted with a paddle attachment. Mix on medium-low speed until creamy, scraping down the bowl with a rubber spatula as needed. Add the heavy cream and beat on high speed until the mixture is light and smooth (do not overbeat). Assemble the Cake: If your cakes baked up uneven or have domed on top, level off the tops. Place one cake layer on a serving plate. Cover with 1 cup of the peanut butter frosting and sprinkle 10 of the chopped peanut butter cups over the frosting. Top with a second cake layer and cover with another 1 cup of the peanut butter frosting, and top with another 10 chopped peanut butter cups. Place the final cake layer on top face-down. Frost the cake with the remaining peanut butter frosting, finishing it as smoothly as possible. Refrigerate the cake for at least 1 hour, until the frosting is set. Make the Chocolate Ganache: While the cake chills, make the chocolate ganache. Place the chocolate in a 4-cup measuring cup; set aside. Place the cream in a small saucepan over medium heat and warm until it just comes to a boil. Pour the cream over the chopped chocolate and let sit for 2 minutes. Begin whisking the mixture in the center, gradually working your way outward until the ganache is completely smooth. Set aside to cool, whisking occasionally, until it has thickened slightly, yet still a pourable consistency. Garnish the Cake: If the ganache was mixed in a bowl, transfer it to a 2-cup measuring cup. Slowly pour the chocolate ganache into the center of the cake, letting it push itself outward and flow over the sides of the cake. Top with the remaining 10 chopped peanut butter cups. Refrigerate the cake for at least 30 minutes, giving the ganache a chance to set up. Keep the cake refrigerated, removing it from the refrigerator about 20 minutes prior to serving.